One way of illustrating the unique nature of project work is in terms of the project life cycle. Some project managers find it useful to use the project life cycle as the cornerstone for managing projects. The life cycle recognizes that projects have a limited life span and that there are predictable changes in level of effort and focus over the life of the project. There are a number of different life-cycle models in project management literature. Many are unique to a specific industry or type of project. For example, a new software development project may consist of five phases: definition, design, code, integration/test, and maintenance. A generic cycle is depicted in the chart below. The project life cycle typically passes sequentially through four stages: defining, planning, executing, and delivering. The starting point begins the moment the project is given the go-ahead. Project effort starts slowly, builds to a peak, and then declines to delivery of the project to the customer. Defining stage: Specifications of the project are defined; project objectives are established; teams are formed; major responsibilities are assigned. Planning stage: The level of effort increases, and plans are developed to determine what the project will entail, when it will be scheduled, whom it will bene- —at quality level should be maintained, and what the budget will be. Is the project on schedule, on budget and meeting specifications? What are the forecasts of each of these measures? What revisions or changes are necessary? 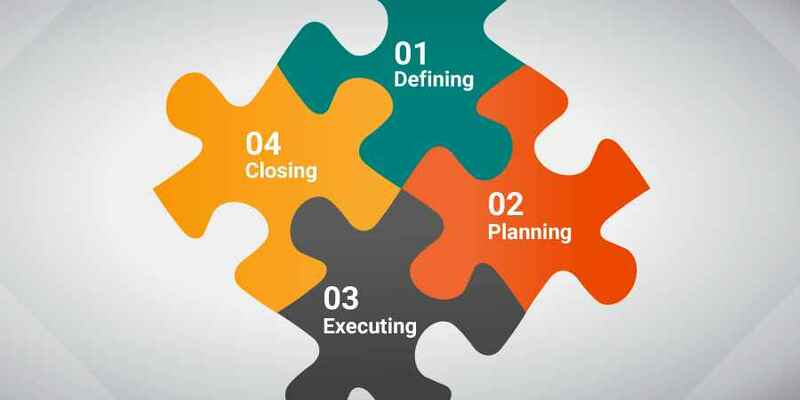 Closing stage: Closing a project includes three main activities: delivering the project product to the customer, redeploying project resources, and post project reviews. Delivery of the project might include customer training and documentation transfer. Redeploying resources usually involves releasing project equipment or materials to other projects and finding new assignments for team members. Prost project reviews often include assessing the project’s performance as well as capturing lessons learned. In practice the project lifecycle is used be some project groups to depict the timing of major tasks over the life of the project. One example might be, the design team might plan a major commitment of resources in the defining stage, while the quality team would expect their major effort to increase in the later stages, while the quality team would expect their major effort to increase the later stages of the project. Because most organizations have a portfolio of projects going on concurrently, each at a different stage of each project’s life cycle, careful planning and management at the organization and project levels is imperative.